At the advent of reality TV, I thought myself better than everyone else because I refused to watch shows like The Bachelor, The Bachelorette or any of those other programs showcasing cheesy, forced romance and contrived drama. I did not count my personal favorites—Survivor and The Amazing Race—in the ridiculously-fake-reality-TV category. I told myself (and everyone else) that I enjoyed those shows because they highlighted adventure in exotic, faraway lands. Was I at all addicted to the “drama” that took place on beaches and jungles on the opposite side of the globe? Maybe. Because now there is a wee bit of evidence supporting the theory that I, just like everyone else, most likely was. I have recently developed a slight addiction to a certain show that has made me question my self-proclaimed exemption from the desire for drama-on-display. The show is Hoarders. And I am actually rather obsessed with it. Like a horrific car crash by the side of the road or gruesome crime scene photos shown on Dateline, I cannot seem to look away. I find myself consistently drawn in by the ewwww-factor and the UGH-factor and the oh-this-is-so-absolutely-sad-and-disgusting-and-unbelievable factor. I have long been fascinated by the inner workings of the human psyche. And based on ratings alone, I am not the only one. Let’s be honest… you’re Norman Rockwell neighbors, working 8 to 5 and grilling out on the weekends don’t exactly make for an interesting case study. But your crazy lady-next-door-with-a-million-cats-and-60-tons-of-trash-on-her-front-lawn kinda does. Questions spring to mind such as: Why is he or she like that? What is wrong with them that they feel the need to cling to dead squirrels, pre-WWII cans of tuna or rotted jars of peanut butter? When are they going to tire of climbing over laundry, furniture and pizza boxes to get to their toothbrush? How are they OK with rats and roaches running rampant over heaps and piles of junk collecting in every nook and cranny of their living spaces? I’m not sure if it is a form of escapism, or a way for us to affirm our own “normalness” as we watch others so tragically struggle just to keep both feet on the ground. Perhaps it is nothing more than our innate voyeuristic nature at work. But one thing is for sure… As long as there are humans on this planet and television cameras rolling, we will tune in and watch other people’s drama (be it real or fabricated) while it unfolds before us in our living rooms, with the curtains drawn and a bowl of popcorn in our lap. The one that shocked me the most was about this one woman, a fellow Ohioan ( can’t remember which part). She lived in a rural community and was animal hoarding. She was just unbelievable! I don’t know if you’ve seen that one, but she was keeping her chickens stacked in a tight cage and they had feet deformities as a cause of her abuse. On top of that she was mean spirited and not the sharpest tool in a shed, if you want my honest observation. It was very disturbing. Still, like you, I couldn’t look away. 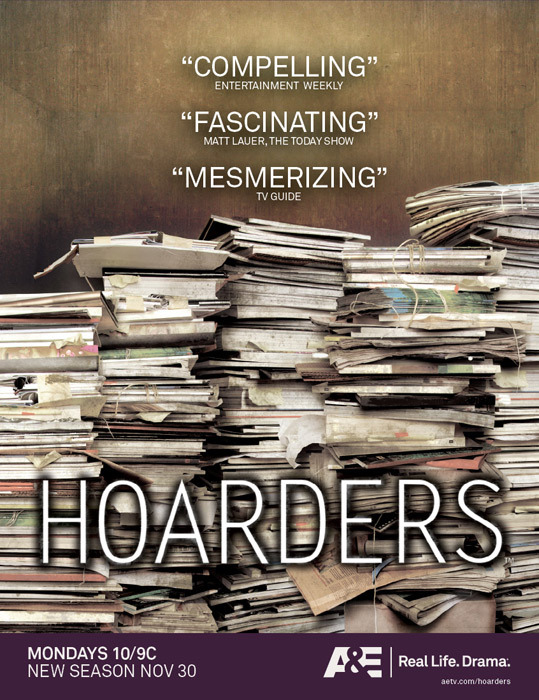 Hoarders is one of those disorders that I can’t relate to or understand no matter how hard I try. I just can’t imagine living that way. That was one that I could not watch. I wanted to slap that woman. Stupid horrible evil woman. I’m afraid the appeal of every single one of these shows is that they create extremes that allow us to feel superior. It’s a winning formula, the TV people know it, and they are getting better and better at it. They make “reality” shows more compelling every day. Expect something new to get addicted to just around the corner. I absolutely agree… I joke about watching it to make me “feel better about myself” but there is a lot of truth to that! I have watched a show or two of Hoarders and could not look away or turn the channel, especially when children or animals are involved. You try to understand why while having a wide range of emotions. I find myself tuning into and getting hooked on certain shows and wonder at times what really is drawing me in. I used to regularly watch Intervention, though I’m normally very averse to conflict, so why I wanted to watch people forcefully confront their alcoholic loved ones, I’m not sure. Perhaps it’s because I have alcoholics in my family? I had to stop watching it, however, because I found myself subconsciously retaliating: I’d watch episodes about alcoholics while swigging wine. I ate a half-bag of Pizza Rolls while watching one about an anorexic. There was one about a guy addicted to working out, which I watched during a three-hour block spent entirely on my couch. I think your point is an astute one: these shows say more about their viewers than their stars. The question is, what are they actually saying? Heather, you and Renee both make the same interesting point… or raise an interesting question: What really is drawing us in? And what does it say about us that we find this to be such “entertainment”? Sometimes I feel as if I have hoarding tendencies. I know that I don’t because I don’t keep trash and junk like those people!!!!! That is insane. And yes I think that is what these people are. Insane. Some of them just need to be put in a hospital by themselves. It’s just plain nasty. I do live in a small house without enough storage and I am not good at organizing anymore so when I watch hoarders I get up and clean and throw things out during the commericals and after the show. I think a lot of people go on “cleaning binges” after watching that show. The shower in my bathroom is currently all torn up and the contents of my bathroom closet have no other place to go than my guest room floor. Every time I walk past… I think that my pile of beauty products and towels looks like the beginning of full-on “hoard.” You’re definitely not alone!